The government has decided to reclassify cannabis as a class B drug. The decision to reverse the downgrading of the drug from class C, which took place in 2004, was taken despite advice from a government-appointed committee of experts. 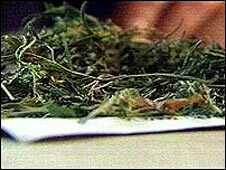 BBC News looks at what evidence there is to suggest cannabis is harmful to health. Cannabis is a plant which has been cultivated by humans for thousands of years. It contains chemicals called cannabinoids which are unique to the plant. These include a substance called delta-9-tetrahydrocannabinol (THC) which is believed to be largely responsible for the effects that the drug has on the brain. How is the drug used? It is usually smoked, but can also be eaten. When smoked THC is absorbed into the bloodstream and accumulates in the brain and other major organs. It can produce an effect on the brain within minutes. A proportion of the chemical will also linger in the body, and can produce subtle mental and physical effects over a long period. If the drug is eaten, less THC reaches the brain, and it takes longer to get there. Cannabis produces a feeling of euphoria, known as a high. It may also trigger changes in perception. For instance, colours may seem brighter and more intense, and emotions may be heightened. However, there is strong evidence linking cannabis use to feelings of anxiety and panic. It is also associated with lethargy, loss of communication skills and a general lack of ambition. However, cannabis is not thought to affect memories which are already in place - only the ability to store new ones. Is there a link to mental illness? The Advisory Committee on the Misuse of Drugs said there were major difficulties establishing a cause-and-effect relationship between cannabis use and the development of psychotic illnesses, such as schizophrenia. It said the majority of young cannabis users did not develop psychotic illness, and those that did were likely to have predisposing factors, which may be genetic. It concluded that in the population as a whole, it was most likely that cannabis played only a "modest role" in the development of psychotic conditions. But mental health campaigners do have concerns. The charity Rethink says a review of research published in The Lancet last year found frequent cannabis use increased the risk of psychotic illnesses like schizophrenia by 40%. Studies have also suggested that using the drug can trigger psychotic symptoms such as hallucinations and feeling out of touch with surroundings in some people. However it is unclear whether these symptoms are short-lived, or if they persist even when use of the drug is stopped. Mental health charity Mind has reported psychiatrists have seen an increase in numbers of people being hospitalised with psychotic episodes linked to cannabis use since the drug was downgraded. Many experts believe that use of the drug can worsen symptoms in someone who already has schizophrenia, or manic depression associated with psychotic symptoms. There is also a body of evidence beginning to emerge that long-term use of cannabis in early teenage years puts an individual most at risk. But sceptics say those who are affected have already demonstrated a predisposition to problems. A British Medical Journal study in 2004 concluded that while cannabis use moderately increased the risk of psychotic symptoms in young people, it had a much stronger effect in those who had already had mental health-related problems. In November 2005, Glasgow and Edinburgh University researchers found damage to a certain brain gene was the key to determining risk of developing serious mental health problems. The finding prompted experts to say mental health problems were "too complex" to be put down to one factor, either environmental or genetic. What about other health risks? Cannabis is usually smoked with tobacco. Therefore regular users are also at increased risk of a wide range of ailments linked to smoking. These include an increased risk of various forms of cancer, and heart disease. Is the drug getting stronger? There is some suggestion that modern formulations are stronger. In the 1960s the average cannabis "joint" contained about 10mg of THC. Hybrid varieties of cannabis - including a type known as skunk - are known to contain higher than usual levels of THC. These are produced by intensive indoor cultivation are, on average, around twice as potent as the herbal cannabis and cannabis resin available 20 or more years ago. Researchers are therefore concerned that much of the research into the effect of the drug may be out of date. Sativex, a cannabis-derived mouth-spray, is licensed in Canada to relieve pain in people with multiple sclerosis (MS). The Home Office has given the all clear for it to be imported in to the UK, although an application for a full licence was rejected in 2004 on the grounds that the benefits were inconclusive. Drug firms are known to be exploring the possibility of developing other cannabis-based medicines containing THC for MS, cancer and back pain. Research has linked THC on its own to increasing the risk of anxiety and paranoia, but manufacturers say the levels of the chemical in potential treatments is much lower than that used in the studies.